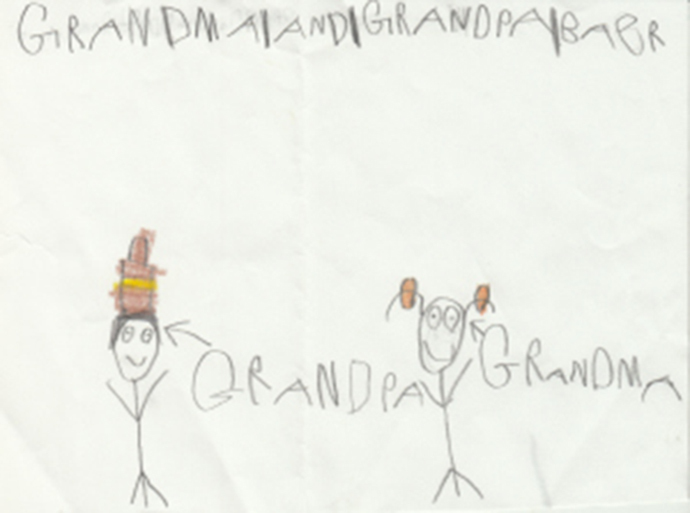 One of my most cherished possessions is a stick figure drawing of my husband and me drawn by my grandson. Dave has a forthright gaze, and a jaunty, striped hat sits on his head. My hair is optimistically drawn in pigtails, and my hair bows are colored to match Dave’s hat. Many things about this precious picture appeal to me. For one thing, I’m portrayed as skinny, as stick figures always are, even though I am not! The delightful labels and arrows, helping to distinguish between drawings of my husband and me, are charming. And I love the confident lettering of the title words, separated by thick bars so anyone who sees the masterpiece will know exactly who the subject of the drawing is. But the best parts are the slightly lop-sided smiles on each of our faces. Dave and I may be quirky-looking, but we’re happy. The sweet little boy who drew this picture saw that Dave and I were happy. I suppose he thinks we always are—probably because we ARE always happy when we can see him and his family. But even though we have now been married more than 30 years (and we like to think we’ve worked out most of the kinks. . .), we have occasions of rancor. Not too long ago at the dinner table, Dave said something that made me put down my fork and burst into tears. Even more recently, I said something quite sharply to Dave, again at the table. Our kids have memories of loud voices (mostly mine) and one particularly shameful episode of a pillow being tossed out a car window (me again). I don’t want to paint Dave a saint and me a shrew—though he might not entirely disagree with that picture—we are just people living together, not always in harmony. Our children have certainly seen the truth in the old adage: “when two partners always agree, one of them is not necessary.” Obviously, Dave and I are both necessary. And our home, while generally happy, was (is!) not always peaceful. For a long time I worried that this atmosphere would adversely affect our children. Would they leave home as soon as they were able? Would they treat siblings and peers unkindly? Would they fear Dave and I are headed toward divorce? Would they hesitate to marry themselves? I think one important reason the kids felt secure, despite the occasional spat, was our commitment to our marriage. Dave and I were married in the Salt Lake City temple of the Church of Jesus Christ of Latter-day Saints. This December will be our 32nd anniversary. Our marriage was performed by a man who held the power—priesthood power—to seal us together as husband and wife for all eternity. Simply put, Dave and I will be married to each other even after we die. Of course, like all covenants made with God and blessed by the priesthood, the promise of eternal marriage depends on our willingness to be faithful. But we ARE willing. 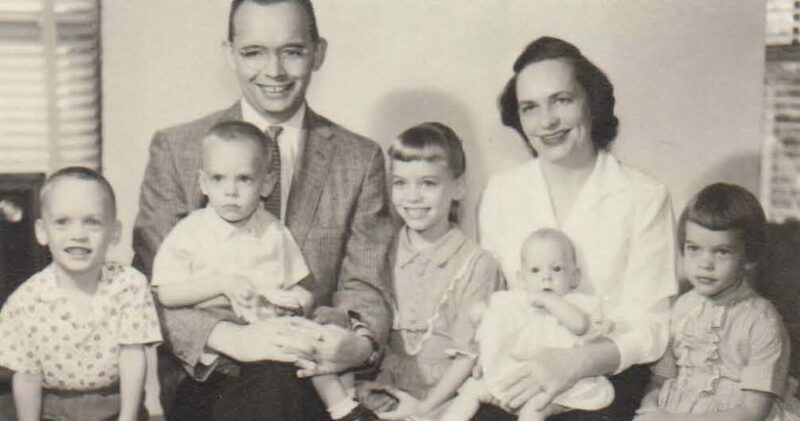 Much of what I know about marriage and its natural partner, the family, is found in a prophetic proclamation called “The Family: A proclamation to the World.” You can read it for yourself here. Knowing we are taking part in a plan devised by our loving Father in Heaven brings much to our marriage. We have delighted in the opportunity to have children. We recognize our responsibility to love each other. We know that following the teachings of the Lord Jesus Christ will bless our lives and the lives of our children and our children’s children. We look forward to accounting for our efforts as husband and wife, as father and mother. We are not getting it all right, so we’re grateful we can rely on the principles of repentance and forgiveness. But, as our much-loved grandson has noticed, we are happy. P.S. I checked with Dave–we’re in agreement on this one! This entry was posted in Family Relationships, Forgiveness, Gender Roles, Priesthood/Authority from God, Repentance, Temples/Family History/Genealogy. Bookmark the permalink.